It's time to kick off Holiday Season! This year, the holidays are a little more special to me because I'm living on my own. It's my first time to ever go out and buy Christmas decor, decorate my own tree and host my own cocktail parties. Ever since I was little I always dreamed about this! I know, you may think it's silly, but I was raised in a Christmas loving family. My mom, god love her, has an entire shed in the backyard dedicated to Christmas decor. Every year our house would transform into this magical wonderland full of Gingerbread Kitchen, Snowmen Living Room, Santa Family Room. Every room had it's own theme, and there wasn't one spot of the house left untouched. Well, her magic decorating elf dust has sprinkled its self on me. For now I find myself roaming the stores planning out my themed rooms. Buying up endless amounts of red and green. 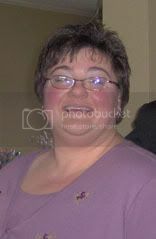 And with each purchase I make I find my self smiling more and more. I never knew that creating my Christmas Wonderland could lift my spirits so much. To compliment my "high spirits" theme, I decided to give my Arborio Rice Pudding of this week's TWD challenge some added spirit. When I saw that Isabelle of Les Gourmandes d'Isa chose this recipe I decided to stray away from the original flavors of vanilla and/or chocolate. 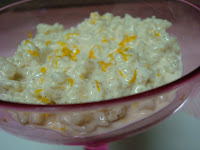 I wanted a little kick to my rice pudding, so I added a little cinnamon, orange zest and Grand Marnier. I also noticed that many TWD-ers were having probably with their puddings being to liquidy, so I actually used 1/2 c of rice and reduced the milk by about 3/4 of a cup. 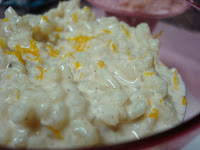 I was left with silky, creamy, orange-y rice pudding. I was tempted to eat my whole margarita glass, but I put the spoon in the dishwasher before I had a chance :) This recipe was such a cinch to make, and has endless possibilities to it. So I raise my glass and toast to the kick off of the Holiday Season, may all your days be merry and bright! Love the orange zest and Grand Marnier! And finally moving out and having your own Christmas is the BEST! You get to start your own traditions, decorate your own tree/place! It's amazing! Hello and welcome back to TWD. 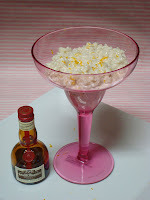 Grand Marnier flavored rice pudding sounds delicious. Great job! Next time I want to add orange zest. Sounds yummy. 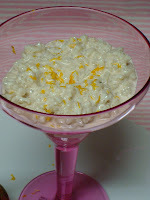 Great looking rice pudding! Ohhhhh, this sounds good. And shopping for your own Christmas decor IS fun. Hope you share some of your finds!